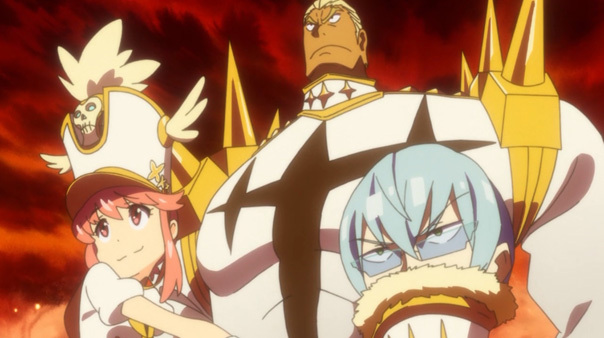 A mark of a great anime, or any show for that matter, is a deep bench—a well of compelling characters they can draw on if they’re inclined to give the main stars a rest. Golden Time (in theory) and Chuunibyou (in practice) are examples of this, and it was never in doubt that Kill la Kill was as well. 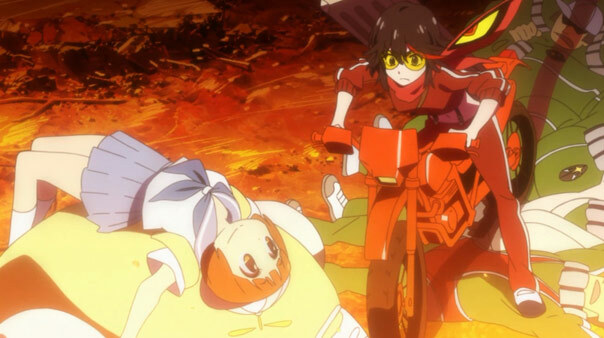 It may not have been until episode 19 when both Ryuko and Satsuki are set aside for the supporting cast to show they can carry an episode without them, but it was worth the wait. A month has passed since Ragyo reclaimed the upper hand by unleashing her army of Covers on Honnouji, and everything’s gone her way since. 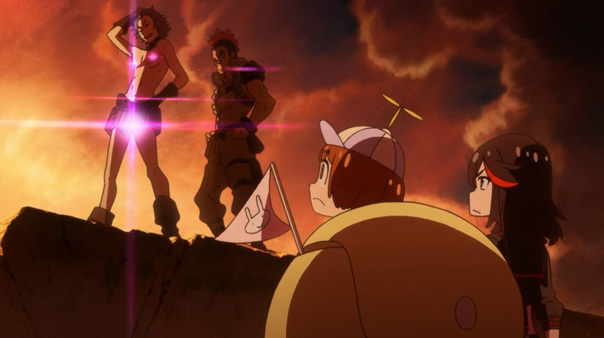 The Elite Four plus Iori and Soroi joined Nudist Beach—and abide by its dress(less) code!—but are fighting a war of attrition against Covers, which have conquered every academy in Japan, assimilating its students and brainwashed the populace. When we drop in, Uzu is fighting the good fight in his Goku uniform, when it suddenly fails. Then we learn his goku was the last one. It’s always thrilling to see a genuine shattering of the status quo and reshuffling of alliances, and this episode is no different; it’s cool to see the Elite Four in Nudist Beach lack of garb, fighting along side their former enemies. 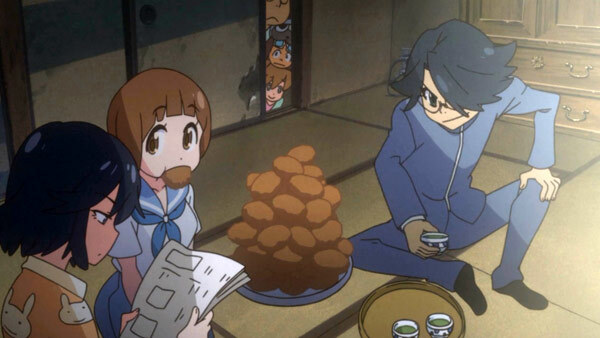 It’s also good to see the Mankanshokus are surviving, under the constant threat of Cover assimilation, keeping a slumbering Ryuko (who Senketsu dragged home) safe. Also nice to see Gamagoori’s crush on Mako blossoming as he promises her fam he’ll get her back…which he eventually does (with help from Guts). Satsuki is hanging naked from her arms in a big birdcage, defenseless to whatever sexual assault Ragyo happens to be in the mood for (She’s also saving her for an extra-special new ultra-kamui Nui is preparing). But when Ragyo leaves, Satsuki vows to escape. Far from emotionally defeated, she knows she can still win simply because she’s alive. That nicly mirrors what Barazo says about being alive being its own victory: things can work out. This whole episode reminded us of Star Trek: Deep Space Nine episode “A Time to Stand”, which takes place after the titular station has been taken over by the enemy and the good guys do what they can to keep themselves and the fight alive. Sukuyo just can’t seem to take her eyes off of Mikisugi’s…light. Love the scene where the guys have a nice cuppa while discussing strategy. Jakuzure can’t help but admire Mataro’s ability to survive.